I always ask everyone where their interest in weather began. I got my interest growing up here in Miami. As I kid, I was fascinated by the weather and particularly with hurricanes and how they worked. I remember doing class projects on hurricanes in grade school. Was there a particular storm that tipped you towards hurricanes? The first one I experienced was Betsy (in 1965), but I was only six months old. My family had just moved here from Illinois. They were about ready to turn around and go back home. Oh yes! The next hurricane wasn't until David in 1979. I was 14, and remember tracking it with the NOAA weather radio. We had a bit of wind and rain, but the hurricane core was over Singer Island in Palm Beach County. Hurricane Frederic was just a week or so later, and I eventually got class credit for studying it. I was a senior at Miami Palmetto Senior High School and had the chance to work in a research lab for class credit. It's a public school program, and they still have it in Miami-Dade County (now called the Honors and Executive Internship Program). I would get out of school early, and then I would work with Jack Parrish and Frank Marks over at the NOAA Hurricane Research Division in Virginia Key. It was Hurricane Frederic that I was working on, looking at sheets of radar reflectivity, and plotting the cells that were spinning around the storm. We were trying to determine that speed of the cells and comparing it to the wind in the storm. For me, it was a first look at doing real research into hurricanes. And after a few hours work, Jack Parrish and I would go wind surfing right from the Key! And college was at the other end of the country? When I was looking for a college, there were two things I wanted: (1) a meteorology program, and (2) a water polo program. There were only two universities in the entire country then that had that unique combination. One was UCLA; the other was the Air Force Academy. I wasn't really interested in the Armed Forces, so I went to school at UCLA, got my meteorology degree and played varsity water polo. You have several advance degrees. Upon graduation from UCLA, I went to NOAA's Aircraft Operations Center (now in Tampa) for nine months. I was working with Jack Parrish, Jeff Masters and Barry Damiano. I got onto the Orion P3 aircraft for a couple experiments. 1988 was a late starting season, and I had to begin graduate school at Colorado State University before there were any hurricanes to fly. My professor there was Dr. Bill Gray. When the "G" storm (Gilbert) was coming across the Caribbean, he sent me and two other grad students down to Miami. We showed up unannounced and asked if we could get aboard the next flight into the storm. That was a record storm. We were on the flight that measured the record 888 millibars central air pressure and the storm exploded into a Category 5 while west of Jamaica. It was amazing. My first hurricane flight was a Cat 5! You mentioned Dr. Bill Gray. How long did you work with him? He was my academic advisor at Colorado State for my Masters and Ph.D. I was there for six years and I was focused on seasonal forecasting and climate changes of hurricanes (why some years and decades are busy and some are very quiet). That was ground breaking work at the time. Bill Gray had just begun the seasonal forecasting in the mid '80s. So for my graduate work I really focused on developing new statistical models, some which worked, some of which haven't worked as well. But I learned a lot about the prediction process and even more about how hurricanes have changed over time. While I was in Grad school, it was a very quiet period for hurricanes and part of the research I was doing was helping Dr. Gray anticipate when we may switch over to a busy era. And we certainly have, beginning in 1995. So your background is largely research. Yes, though I did spend one summer at the National Weather Service forecast office in Los Angeles as a SCEP (Student Career Experience Program) intern. It didn't rain at all the entire summer so it was kind of boring, but still a great experience. I also went to Australia for a year for some post-doc work, which was an amazing opportunity to see other parts of the world before settling down. I spent six months at the Bureau of Meteorology Research Centre in Melbourne for six months and at Macquarie University in Sydney for another six months, teaching. In 1995, I started a post-doc at the Hurricane Research Division, and got a Fed position after a year. I was still working on seasonal forecasting and climate variations, but also participating in HRD's annual field program. That was a fascinating aspect because you can see what a hurricane looks like from the inside, understand what it takes to collect the data, and the difficulties of airborne research and monitoring. That means a lot of time on the hurricane hunter plane. Just about every year I would help out as a dropsonde operator, both on the P3 and the G-IV when that began in 1997. It was a great 10 year experience at HRD. What finally brought you to NHC? I blame Hugh Willoughby to some degree. He was my boss at HRD for a few years, and he wanted me to be the administrative assistant for the Joint Hurricane Testbed. That meant coming over to the National Hurricane Center one day a week to deal with these projects that could help operations. That gave me a little taste of what it's like on the forecasting side and seeing the tools that the hurricane forecasters are using. 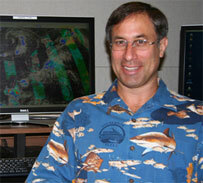 When the Science and Operations Officer (SOO) job opened up in 2005 when Rick Knabb became a Hurricane Specialist, I applied for the job and was fortunate to get it. I still see your name as co-author of a number of research papers. I love the SOO job because it allows you to have your fingers in a lot of different parts of what's going on here, including the marine forecasting we do in TAFB (the Tropical Analysis and Forecasting Branch) all year round, the hurricane forecasting in HSU (the Hurricane Specialists Unit) from May through November, helping out with the NOAA seasonal prediction, assisting with research-to-operations transitions with the JHT. I do get to do a little bit of research on the side and that aspect I really enjoy too. Where do you see the science of hurricane forecasting in the next five years? One road that looks very promising is extending our forecasts further out in time. Currently we do a five day forecast for an existing storm, and we're likely to start testing our ability to go out to seven days in the near future. If that works, I could see us providing public seven-day forecasts in a few years. Additionally, we're testing doing genesis predictions out to five days. Right now, the Tropical Weather Outlook goes through two days. But because the global models are improving so much for providing predictions, we might be able to extend that further out, too. What about the marine side? We are embarking on a big technological change in TAFB, as are going to be a part of the National Digital Forecast Database. So, people will have the opportunity for a point-and-click capability for our marine predictions. Going this way, it should provide our forecasters more time to develop new products or extend our predictions farther out in time. You are known around the building for your colorful attire. Where does that come from? It's a combination of being a Jimmy Buffett fan and having a researcher friend at Colorado State, Paul Ciesielski, who wore them every Friday. I thought that was a good idea and I am wearing them every day. My favorites are the Key West Camouflage brand that we get in the Keys when we visit down there. You're a family man whose children have some unique names. I don't know if they are that unique. There is Mitch, there is Elena, and there is Frederick. Now, why are those familiar? Well, it turns out when my wife and I were looking at names, we did not have to use any family names. So, I gave her a list of names and asked if there were any she thought were interesting. She found a couple boys' names and a couple girls' names she liked, and Frederic, Elena and Mitch were among those. And of course, those are retired hurricanes. (We took a slight liberty with the "Frederic" name and used the spelling with a "k" at the end, as my grandfather's name was "Frederick".) We actually have at our house big pictures of Hurricane Mitch, Hurricane Elena and Hurricane Frederic because we named our kids after retired hurricanes. What do you do to spin down?